In a medium mixing bowl, whisk together the chocolate pudding and cold water. Add the can of sweetened condensed milk and whisk until smooth. Place the bowl in the refrigerator. In a medium (or large) mixing bowl, beat 1 cup of the heavy cream with electric beaters until soft peaks form. Remove the pudding mixture from the refrigerator and fold in until completely combined. Distribute the pudding mixture evenly among clear individual glass or plastic cups or jars (a 6-ounce cup with a wide rim would be the perfect size for pudding, plus a little extra room for the dirt, ghost, and tombstone). Place the pudding cups in the refrigerator. This step can be done up to 24 hours ahead of time. Place 2 cups Oreos in the jar of a blender and pulse until you have Oreo crumbs. Sprinkle over each pudding cup so it looks like dirt. Using the marker or melted chocolate (snip off a tiny corner of the bag), write “R.I.P.” on the top of each Mint Milano cookie. Insert each cookie into one side of the pudding cup. In a large mixing bowl, combine the remaining 1 cup heavy cream and the powdered sugar. Beat until medium peaks form (be careful not to turn it into butter, but you want it to hold its shape.) Transfer the whipped cream to a large Ziploc bag and cut off a corner so you have about a 1/2″ opening. 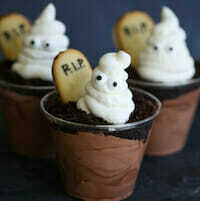 Swirl the whipped cream on top of each pudding cup like in this tutorial to make a ghost. Add two eyes to each ghost.